James Neal has high hopes his younger brother, Michael, will one day join him on the Dallas Stars roster. The younger Neal, 19, was drafted in the fifth round (No. 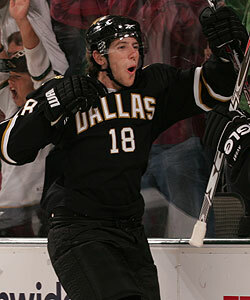 149) by Dallas in the 2007 Entry Draft. The 6-foot-2, 205-pound left wing is currently playing for the Sarnia Sting of the Ontario Hockey League where he has scored 4 goals, 12 points and 28 penalty minutes in 36 games. "We never actually had a chance to play on the same team since he was two years older, but I admired what James did because he's a good, hard-working player so I try and emulate his game," said Michael Neal, who actually joined his brother on Dallas' Traverse City tournament roster in September. "Mike is a big physical guy, very similar to the way I play, so I'm hoping he can go back to juniors this year, play well and then maybe get a contract, come out and gain some experience in the AHL," James Neal said. MONTREAL -- James Neal isn't your every day flash in the pan, first year NHL performer. As a teenager growing up on the north shore of Lake Ontario in the town of Whitby, Neal made it a point to train with the best of them. "Growing up, it was all hockey and the fact I had an opportunity to train with guys like Gary Roberts and Adam Foote was as good as it gets," Neal said. "I started training with Roberts when I was 16 by going to his gym in Toronto and I got to know him very well. When I finished up in Toronto, I started training with Foote who lived right around the corner from me in Whitby. "I marvel at how these guys have been able to stand the test of time and play so consistently year-in and year-out," Neal said. "And they're always two of the hardest-working guys out there." In addition to learning the importance of building endurance and strength over the course of a full NHL season, Neal received first-hand experience on how to maintain a professional work ethic. "Players are so much bigger and stronger so you just have to be on top of everything all the time," Neal said. "I learned the importance of training by working out with Adam because that's what enables you to play, what seems to be, forever in his case. He was so intense and was someone to look up to, not just because he's an NHL player but obviously because he's from the same town I grew up in. So he did basically the same things growing up." Neal became just the fourth player in Stars history to score a goal in his NHL debut -- a 5-4 overtime victory against the Columbus Blue Jackets on Oct. 10. He registered three shots, four hits and totaled an impressive 16:13 in ice time on 19 shifts. Neal's tip-in goal, assisted by Stephane Robidas, gave Dallas a 2-1 edge 8:04 into the second period. He would record his first hat trick on Dec. 23 in an 8-2 triumph against Toronto. All that hard work was rewarded as Neal was selected to represent the Western Conference in the 2009 YoungStars Game in Montreal on Saturday. Through 34 games, Neal ranked tied for first among NHL rookies in goals (13), second in shots (80), second in power-play goals (4), second in takeaways (29) and third in hits (80). He averages just over 16 minutes of ice time each game. Neal, a second-round selection (No. 33) by the Stars in the 2005 Entry Draft, initially thought he would be given the opportunity to make the big club last season after playing a part in Team Canada's gold-medal winning performance at the 2007 World Junior Championships in Sweden. Instead, he spent the year with the Stars' American Hockey League affiliate in Iowa. "I was coming off a good junior career (with the Plymouth Whalers of the OHL) and I thought I could come in and battle for a spot," the 6-foot-2, 185-pound left wing said. "But I went down to Iowa, which was the best thing for me and got some pro experience. I had a good year and, this season, felt I was ready to play. You can just sense that you're close to making the jump to the NHL and I have the confidence now. I just want to keep making a good impression and play my role." Stars co-General Managers Brett Hull and Les Jackson feel the extremely humble Neal learned plenty in Iowa. The GMs were impressed with Neal's play during the NHL prospects tournament in Traverse City, Mich., in September when their top prospect led the tournament with nine points as the team's alternate captain. "He stepped in last year at Iowa and, while it was an eye-opening experience for him, proved he was ready." Hull said. "He thought he was going to play on the big team but he learned a lot and learned the pro game. These younger players have to make it very hard on us to make decisions with our team during training camp; that's what we want because they're the future of the franchise. He just needs to learn how to play in the NHL, both mentally and physically." Dallas assistant coach Stu Barnes has been impressed with Neal's performance. "He's big and strong, has a good skill set and skates very well," Barnes said. "The fact he's physical and has a knack for the net will only help him down the road." In Iowa, the hard-hitting Neal notched 18 goals, seven on the power-play, 37 points and 63 penalty minutes in 62 games in 2007-08. "James has really made some nice strides since we drafted him," Jackson said. "He's obviously playing at the highest level of competition right now and there will be times when it gets tough, but I expect him to be right there because he's a kid who really competes hard and offers a nice blend of skating, some physicality and scoring." Foote, a 37-year-old defenseman with the Colorado Avalanche, is glad Neal is beginning to open some eyes and wishes his friend much luck. "I think he's got great skill, he's big, has speed and he's got good hands," Foote told NHL.com. "I think he's close to figuring it out and I'm glad to see him obtain his goals and where he wants to be and I wish him the best." Neal intends to just continue to do what he does best. "For me, I just want to go in there and prove my physical side because I know they want to see big guys play physical, get in on the forecheck and play hard," Neal said. "That's part of my game and I always try to bring that, in addition to showing some finesse around the net."